After you visit the Old Hallowell Day Arts & Crafts Fair at the foot of Winthrop Street, come over to the Harlow Gallery at 160 Water Street for more creative wares, indoors with air conditioning! The Harlow Gallery vendors will be included in the official Arts & Crafts prize judging. 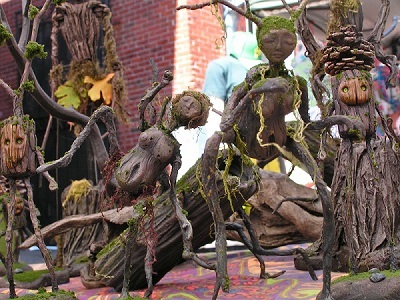 Mind’s Eye Creation is a small Maine based company with a commitment to using recycled materials in creating tree masks, puppets and functional sculptures. A few years back, I started making hand-crafted jewelry under the name of Muffin’s Jewelry Magic. I fell in love with making bracelets, still a specialty, and branched out to necklaces, earrings, pins, rings, bookmarks, cell phone bling, etc. I use quality materials: sterling silver, 14 KT Gold-Filled, Leather, Knotted Hemp, as well as some copper, brass, and other metals. I use natural gemstones as well as Swarovski Crystals and other quality & unique pieces. Most of my pieces are one-of-a-kind, although I have been known to make additional ones if asked. (I was commissioned to make several amethyst bracelets for a Bridal Party after the Bride purchased one on Etsy). I am married, with 2 grown daughters, a grandson, and 2 grand-daughters. My husband and I again live year-round in Litchfield after spending a few years in Florida and deciding it just wasn’t for us (we missed Maine too much!). We have a small farm in South Gardiner on which we work very hard to provide a sustainable lifestyle for our family. We have Nubian and Dwarf Nigerian Goats, pigs, a cow, too many chickens and one of the farmers foolishly bought ducks. Oh, we have three sons, too. Jackie creates soap so the “girls” can pay their way. Our soap is made with fresh, hand milked goat milk and handcrafted in small batches. There is a full line of soapy products: bar soap, shampoo soap, shaving soap, pet soap, New England soap balls, and loofah soap. There are some non-goat milk products as well: lip balm, moisturizer, healing salve and much more. I love the feeling of walking into an old home and having history surround me. I handcraft primitive signs and decorations to allow others the ability to recreate that feeling. I love to use up-cycling as much as possible; old barn boards and picket fences are two of my favorite materials. I have a wonderful husband, four beautiful children and four grandsons. I live in an old farmhouse overlooking the Kennebec in Dresden.